Chinese Commerce Minister Zhong Shan attends a news conference on the sidelines of the National People's Congress in Beijing, China, March 11, 2018. China said Sunday it does not intend to ignite a trade war with the U.S. because the move would be disastrous for the entire world. “There are no winners in a trade war,” Minister of Commerce Zhong Shan said on the sidelines of China’s annual parliamentary session. “China does not wish to fight a trade war, nor will China initiate a trade war, but we can handle any challenge and will resolutely defend the interests of our country and our people,” Zhong said. President Donald Trump signed proclamations Thursday imposing a 25 percent tariff on imported steel and a 10 percent tariff on imported aluminum, with the new taxes set to go into effect this month. European Commissioner for Trade Cecilia Malmstrom, Japanese Minister for Economy, Trade and Industry Hiroshige Seko, right, and U.S. Trade Representative Robert Lighthizer are pictured prior to a meeting at EU headquarters in Brussels, March 10, 2018. Trade representatives for Japan and the European Union met with the U.S. trade representative Saturday in an effort to avoid a trade war over Trump’s new tariffs on aluminum and steel. 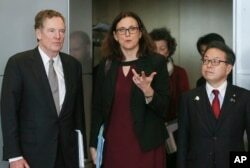 At the meeting in Brussels, U.S. Trade Representative Robert Lighthizer, EU Trade Commissioner Cecilia Malmstrom and Japanese counterpart Hiroshige Seko discussed the tariffs as part of a trilateral effort to combat unfair trade practices. 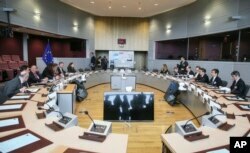 The EU said in a statement that both Brussels and Tokyo had serious concerns about the U.S. tariffs. Both powers, two of the biggest trade partners with the United States, have asked for exemptions from the tariffs. Saturday afternoon, Trump accused the EU of treating “the U.S. very badly on trade.” He said if they drop their “horrific barriers & tariffs on U.S. products... we will likewise drop ours,” he wrote in a tweet. If they don’t, he warned the U.S. would tax European cars and other products. European Union, Japanese and U.S. trade officials confer at EU headquarters in Brussels, March 10, 2018. The EU is still seeking clarity from Washington about whether the 28-nation bloc will be exempt from U.S. President Donald Trump's steel and aluminum. On Friday, the European Union said it is not clear whether the bloc will be exempt from Trump’s steel and aluminum tariffs. Brazil, South Korea and Australia have also asked for exemptions or special treatment.